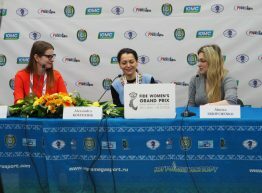 Almira Scripchenko: I hope that the tournament will go well for both of us. 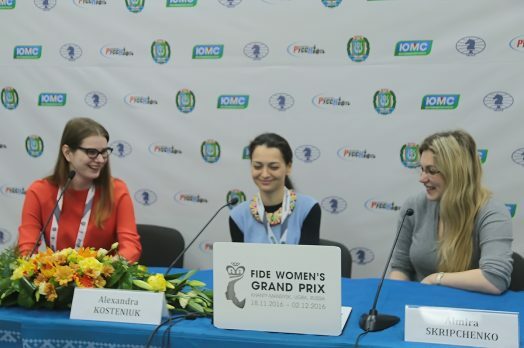 Alexandra Kosteniuk and Almira Scripchenko were the first pair of players who have visited the press-center of the tournament on the first round of the FIDE Women’s Grand Prix. – Do you know the exact number of games you’ve played against each other? Alexandra Kosteniuk: Not so many actually. First time we met on European Championship in Warsaw in April 2001 and for me at that time Almira was like a very big chess star. I wouldn’t call it “idol” because I didn’t have idols but still I respected her very much. I was playing Black and Almira was one of the leaders of that Championship. I was only wishing to qualify for the World Championship and I was so happy that Almira offered me a draw at some point. It was like my dream-come-true result. Alexandra Kosteniuk: Right. And then we met at the end of the year 2001 during the World Championship in Moscow. 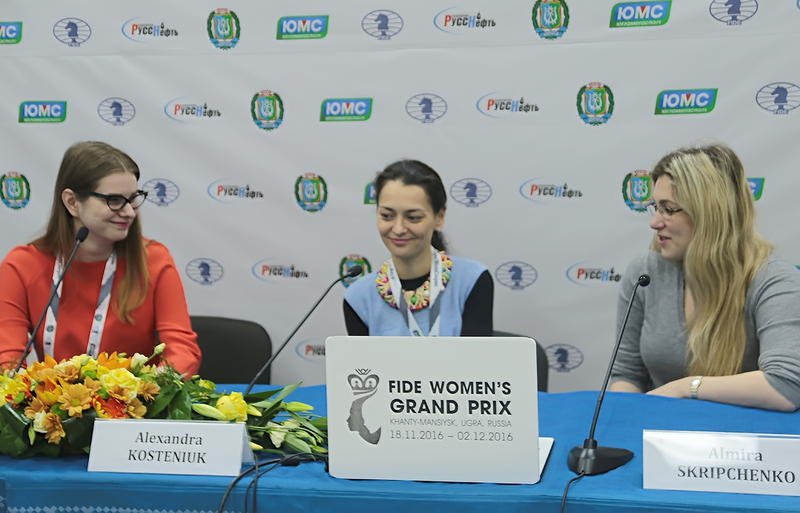 And I was very lucky to go further because I had a very lost position with White in Sicilian Sveshnikov. 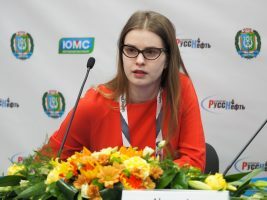 Almira Scripchenko: I think the curious situation is that like everyone during the World Championship they played their games and, of course, as it is a knock-out system it is supposed that you finish a game and you just simply go. And Alexandra and I liked to analyze our games afterwards together. Later we met in Warsaw and actually ended like the best friends. – We know that Alexandra’s daughter is not much into chess, what about your children, Almira? Almira Scripchenko: I think this Damocles’ sword is hanging upon our children. They think like, well, what does our Mom do, what does our Dad do and it takes them a lot time for taking a decision or maybe it is a lot of pressure on them. They both chose an artistic way: my daughter likes theater a lot and Alexandra’s daughter has also chosen this path to express herself. – Now when Alexandra lives in Paris most of the time do you often meet there? Alexandra Kosteniuk: I cannot say that I live there, I pass by often. Now I spend more time in Paris, which is good, because now we can meet more. We can go out and we can be friends not only during chess tournaments. Almira Scripchenko: We actually start to have quite a normal life. Still when we organize some parties at home eventually we end up playing chess in some sort of a tandem with Alexandra. We have played for quite a long time together or make some crazy forms of the game especially against Maxime Vachier-Lagrave who always gives us like 2 minutes. Alexandra Kosteniuk: And he is still successful. 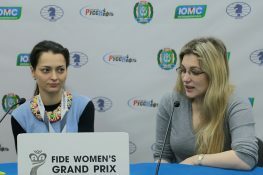 – How many times have you played in Khanty-Mansiysk before and what do you think of the organization of this event? 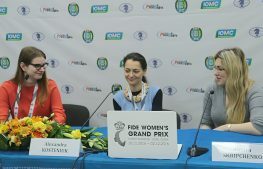 Alexandra Kosteniuk: I think first I came to Khanty-Mansiysk to play in Men’s World Cup in 2009 because I was a reigning women’s world champion at that time. I qualified and since I knew that the World Chess Olympiad was coming to Khanty-Mansiysk in 2010 I was eager to come and to see what it is like to play here. It was rather a very short trip, I lost in the first leg of that World Cup. And then we came back in 2010 as the Russian national team and it was a very good Olympiad for us. We won the event, it was our first win, than we continued winning in 2012 and 2014 but nevertheless Khanty-Mansiysk was our starting point. 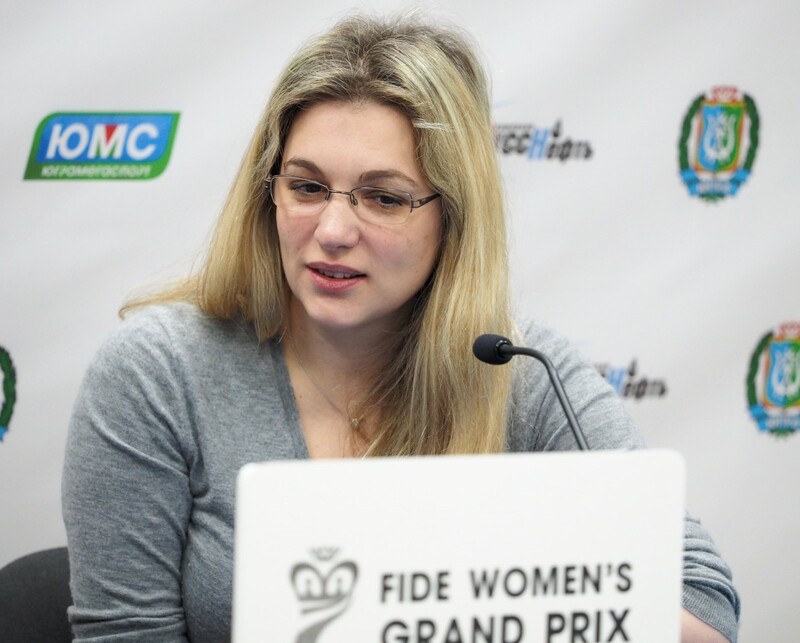 Then I also played here in 2014 in Grand Prix event which was very successful for me and also Women’s World Rapid and Blitz Championships which also went quite well for me but I missed the gold. I took silver which is a good result but I was very disappointed at that time. Nevertheless, Khanty-Mansiysk is a nice chess city for me. I cannot say that I was looking very forward to this event because it’s November and I knew that it is going to be very cold. But I like winter. At least for two weeks it is nice, even if it’s very cold. 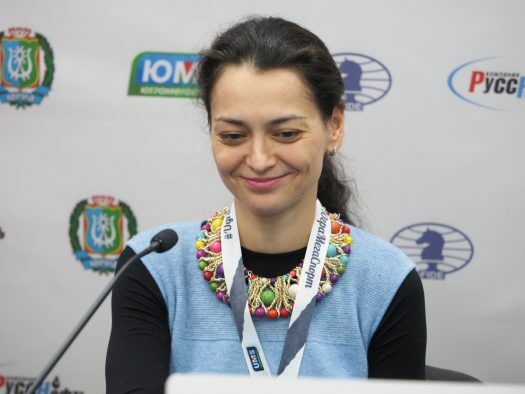 I think that what Khanty-Mansiysk is doing for chess is really a great thing. 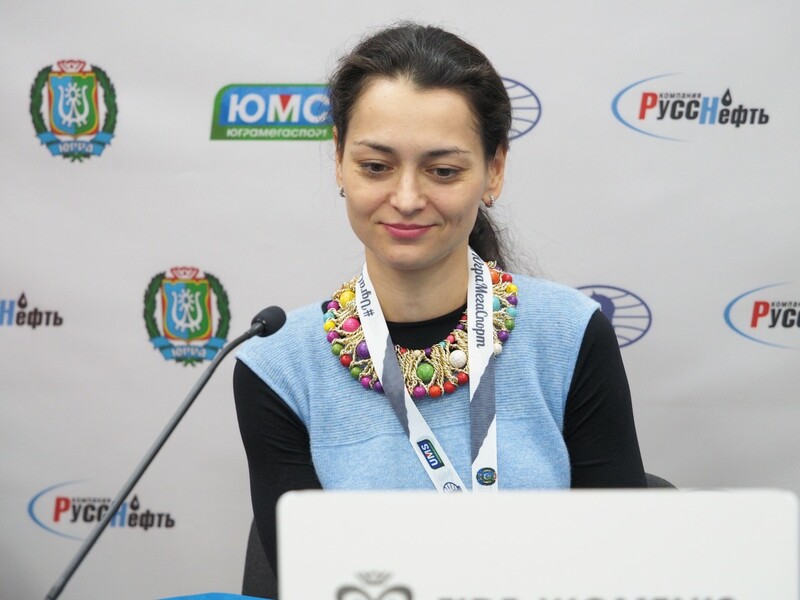 Many Russian and international tournaments are taking place here and we have to thank the government and the chess federation of Ugra. It is a very big deal for chess. Almira Scripchenko: For me it is my second visit here. I played in Khanty-Mansiysk in the World Championship 2012 and I didn’t have a chance to explore much of the region last time. And now I have two weeks ahead. Of course, as Alexandra said, it is extremely important to have a chess academy in the region; a lot of tournaments are organized here. Personally for me, the support of chess is very important, I think, it is a very noble gesture. I hope that the tournament will go well for both of us. All of my friends who do not play chess wanted to know where am I going. When I told them about the temperature they asked why they are sending you there. There’s a proverb “what does not kill you, makes you stronger”. That’s how I am always joking about this. So, ok, we will come back stronger after -36 degrees.